“When the eagles are silent, the parrots begin to jabber”. It seems that the “Decorah Eagles” have officially become America’s biggest reality-TV stars. For those who haven’t yet heard, the Decorah Eagles are a family of Bald Eagles nesting in Decorah, Iowa. The Raptor Resource Project, a non-profit organization that specializes in the preservation of falcons, eagles, ospreys, hawks, and owls, established a Ustream channel, consisting of live, round-the-clock footage of a pair of Bald Eagles and their 3 eaglets. In the last month, the Decorah Eagles have become a full-blown national phenomenon. The stream has been live since February of 2010, but the majority of traffic has arrived since the pair’s eggs began hatching on April 2nd of this year. The Huffington Post wrote a story on the Decorah Eagles in April and, at the time, the channel had attracted 25.6 million views. Today, less than a month later, that number has passed 95 million (currently at nearly 95.9 million). Thus, in 29 days, the stream has tallied over 70 million views, which breaks down to roughly 2.4 million views-per-day over that time. 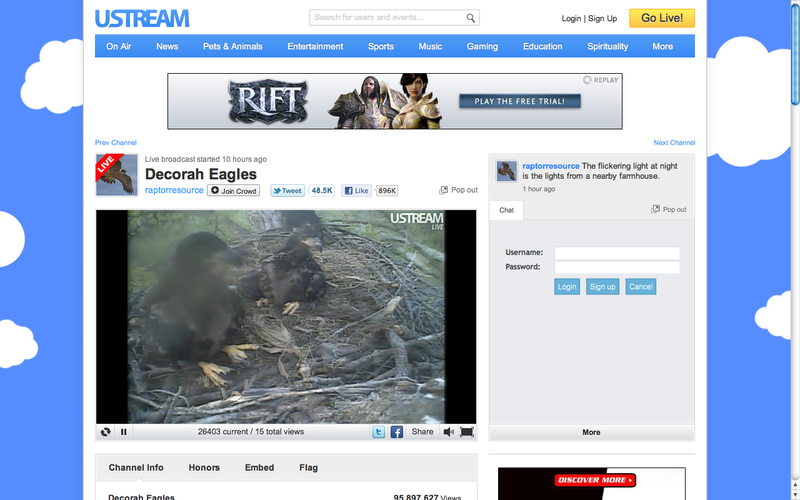 Ustream told TechCrunch that the Decorah Eagles stream has become the most-watched live stream in the company’s five-year history, passing the 34 million views garnered by Ustream’s Canal 5 news page (which covered the Chilean miner saga in September of last year) over the course of the last month. According to the live video platform, the average time spent watching the Decorah Eagles in April, per-unique-viewer, was 6 hours and 10 minutes, and over 2,400 human years have been invested in watching the “eagle cam”. Of course, many people are likely leaving the stream on for 24-hours-a-day, so this skews the figures a bit, but the point remains: People love the eagles. And I don’t mean Don Henley’s Eagles. YouTube’s coverage of the “Royal Wedding” generated 72 Million total live streams, so, considering that Ustream expects the Decorah Eagles to pass 100 million views within the week, the video platform believes that it now has the most-watched live stream (emanating from a single source, or provider). Ever. Though it’s true that the Royal Wedding’s 72 million viewers watched over the course of a much shorter time frame. Ustream Marketing Manager Tony Riggins tells me that the company has been hearing from people from all walks of life, who have been tuning in to watch the eagles go about their day-to-day bird business. He said that they’ve been receiving calls from hospitals, where cancer patients are routinely checking in with the eagles to get a few minutes of much-needed distraction from their treatments. The “Real World Decorah” live stream has also become an inimitable educational opportunity, as classrooms of grade-schoolers through colleges are watching the live stream to learn about biology, natural history, and more. With scientists, bird lovers, seniors, kids, and even bloggers all tuning in, this has truly become what Beverly Macy called a “global social learning experience in realtime”. This is obviously a big moment for Ustream, just as it is for this family of eagles, who are giving the world the best damn reality show it’s ever seen. So far, my pleas to the Eagle Family for an exclusive interview has not been granted, but stay tuned. This just might be my opportunity for some unprecedented embedded reporting. And just for good measure, to appropriately commemorate the occasion, here is John Ashcroft singing “Let The Eagles Soar”. For more on the Decorah Eagles and the man behind the Raptor Resource Project, check out the National Wildlife Federation’s interview with him here.